This page will contain updated news and information about the veterans court’s in Mohave County Arizona. Currently we have Veterans Courts operating in the Municipal Courts of Lake Havasu and Kingman. With your help and support we will be reaching out to Bullhead City and the Justices Courts that cover the county areas of Bullhead, Lake Havasu and Kingman. 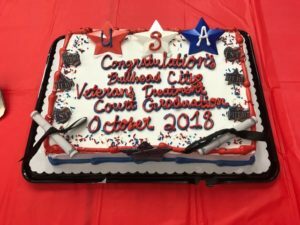 As the Kingman Veterans Treatment Court expands to meet the needs of our veterans in the Justice System there is an increasing need for Mentors. A training class is coming up soon (middle of August) and is a requirement to be a Mentor in this program. Caring and dedicated veterans are needed. This is your opportunity to give a hand up to a fellow veteran in need. You will be making a difference in the veteran’s life, the community and especially your life. Information sheet, requirements and application can be found at this link.